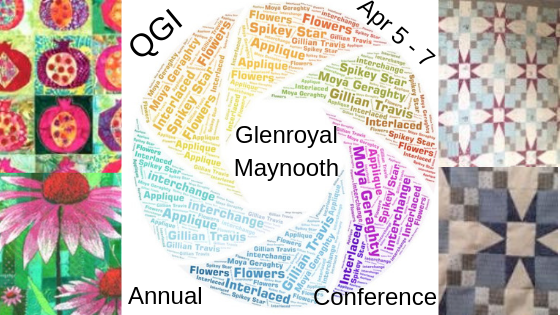 Pattern from Frances McCloskey, Cork. Published July 2013. 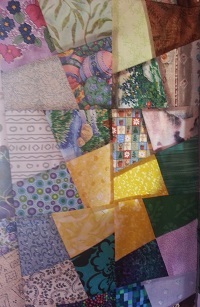 I have been making a charm quilt for a few years. It started from a charm square exchange amongst friends. 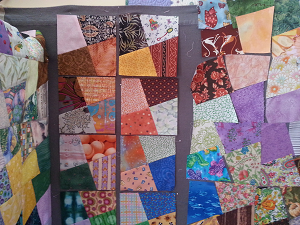 Every month we swapped ten 5 inch squares with each other, building up a great collection of different fabrics. I wanted each patch to be identical and to be of a size that could be cut from either a 4 in charm square or a 5 inch charm square. The shape I chose has two right angles but isn’t a square. 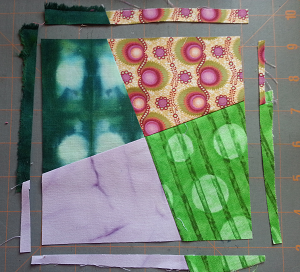 When 4 patches are sewn together this forms a tilted four-patch block. The template is marked with what becomes the centre of the four-patch block and with the edge of the four-patch block. 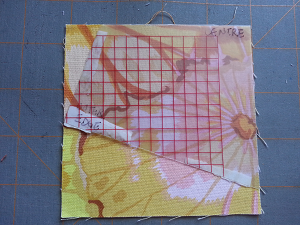 For a 4 inch charm, place the centre of the template in one corner. For a 5 inch charm, place the edge of the template at a corner. 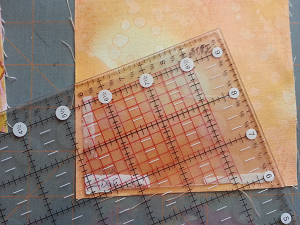 Place a right angle of a ruler over the template to cut the patch. It is fine to cut it a bit larger than the actual template, since the patches will be trimmed to size later. 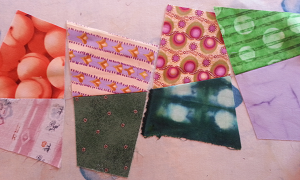 I sorted my charm squares by colours and patterns, then grouped 4 similar values together. These then became the pinwheeling corners of 4 adjacent four-patch squares. Working on a design wall is the easiest way to keep track of what will go where! It is also a good idea to pop the patches up on the wall one day and leave them to be sure that you still like the arrangement the next day. I wanted to have a clear value difference between most sets of pinwheels, but also have areas where the dark/light contrast merges a bit. The odd shape of the patch means that only one end of the first seam has to be matched! That’s my kind of easy piecing. To keep track of which patch goes with which takes a bit of forward planning. 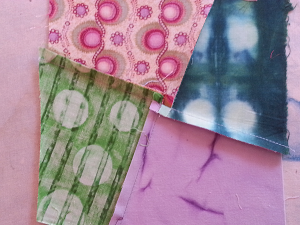 I worked with the vertical column of four-patches. Pair the patches starting from the top of a column, matching just the right angled edge. When pressing, press always towards the “fatter” patch. This means that sometimes you will be pressing dark over light, but it makes it easier to match the centre of the block. 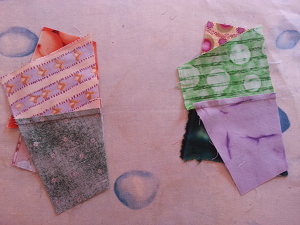 Match the centre seam of each four-patch square, the outer edge will be trimmed after sewing. 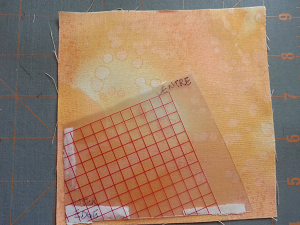 To minimize bulk in the centre of each four-patch square I pushed open the seam allowances. This unpicks a few stitches from the seams in the middle, but makes for a very smooth flat centre. Then trim the four-patch to its finished size. I found it easiest to do this with a square ruler. The cut size was 6 in, with the seams of the tilted four-patch matching the 2 in and 4 in markings. Trim two sides first, then flip the four-patch around and trim the other sides. Repeat for each of the tilted four-patches. 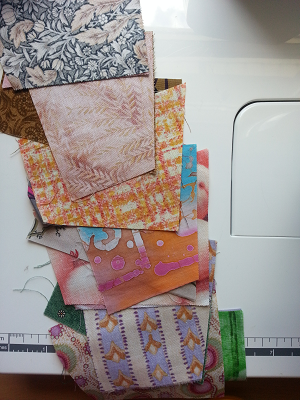 Then stick them back on the design wall until you are ready to sew all the four-patches together. 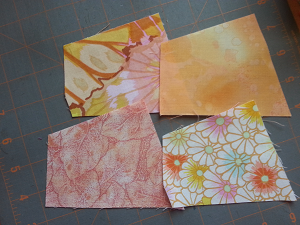 The extra cutting needed in this technique may not suit everyone, but it certainly makes the piecing easy! Only one edge of the patches in the first seam has to be matched and only the centre of the four-patch has to be matched. 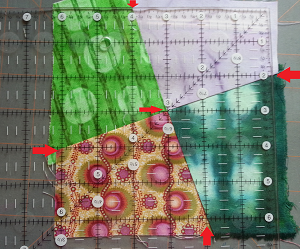 The completed tilted four-patches are exactly the same size and the final assembly is very straight-forward. 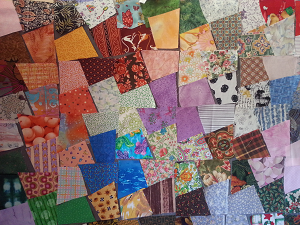 I have three quarters of this quilt made. It is huge! The tilted four-patch finishes at 5.5 inches. 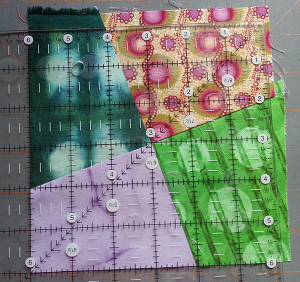 I wanted to use up the charms I had, so the overall quilt is 22 four-patch by 18 four-patch. That’s 121 inches by 99 inches! 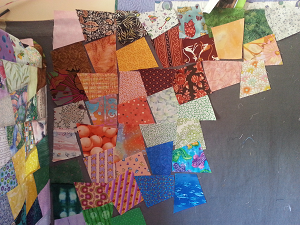 Once it is finished and quilted I will post another image.